All of these were well attended and many were sold out long before the Gathering commenced. Kathleen Verigin started off the pre-Gathering workshop sessions, Friday morning, with an often humorous and heartfelt exploration of the triple spiral labyrinth. Her canvas triple spiral labyrinth, made of two velcroed panels, was designed by Lisa Steckley to approximate the stone petroglyph at the entrance to the pre-Celtic, Irish monolithic site, Newgrange. Participants explored the meaning of the three-fold spiral path as a journey of self-discovery and coming home to ourselves. Kathleen's spritely demeanor and deep knowledge of Celtic spirituality made this workshop a hit with all participants. Carol Maurer and Johanna Manasse shared the spotlight for Friday afternoon's Peaceful Stitching workshop. Sometimes you just have to hunker down, get centered, and put needle to cloth, allowing your inner landscape to be expressed outwardly with each lovingly intentional stitch. For novices and experts alike, and under Carol's and Johanna's expert guidance, this workshop allowed fabric artists an avenue to meld labyrinths with needle and beadwork, creating uniquely beautiful results. And, knowing Carol and Johanna, the laughter and camaraderie that ensued were equally important as the meditative process they imparted. 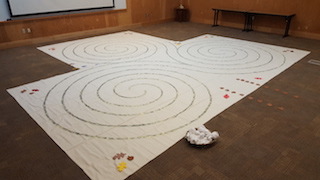 Kelley K. Quinn started off the post-Gathering workshop and tours offerings on Sunday afternoon with an arts workshop about creating personal 12" paper labyrinths using a meditative art process to calm the mind. She provided different labyrinth designs, handmade paper, and other natural materials for participants to create their own piece to take home and use. This was another way for fine artists to explore the use of labyrinths in their artwork and creative processes. Stephen Shibley was the tour guide for the Sunday afternoon Bainbridge Island Tour and put together a lovely afternoon of labyrinth walking, historical home and gardens sightseeing, a museum tour, and a wine tasting that was very well received by the two mini-busloads of attendees. Thank you, Stephen, for a perfect Bainbridge Island ending! Participants who signed up for Denny Dyke's Sunrise Sand Labyrinth Building workshop had to meet the bus at 6:30am so that the low tide, window-of-opportunity was utilized to the fullest. The weather, water, wind, and sand conditions cooperated and participants got a hands-on lesson in Zen sand raking and sand labyrinth building. Attendees experienced the essence of Denny's Gathering presentation and his joyful partnership with the energy of wind, sun, sand, and water. Last but not least, the Monday afternoon tour of Seattle labyrinths lead by local area resident and new TLS Web Chair, Dan Niven, was a carefully curated selection of labyrinths of different designs and sizes. Again the weather cooperated and the large tour bus took off from the Seattle Ferry Terminal at 1:00pm. First stop, the rustic, seven circuit classical labyrinth at the Rudolf Steiner bookstore where attendees were treated to Halloween cupcakes and fresh cider after walking. 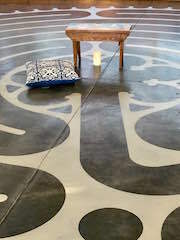 Then on to two outdoor church labyrinths, an indoor church labyrinth, the large, outdoor labyrinth opposite the Seattle Space Needle, and finally, a lovely indoor labyrinth at the Welcome Table Community Church on Beacon Hill. The afternoon sun shone gently through the high clerestory windows down onto the labyrinth as we walked with soft music playing in the background. The energy was lovely there and all enjoyed that stop immensely. Thank you, Dan, for your thoughtful compilation and contacts that allowed participants access to the indoor sites often not available to casual labyrinth sightseers.